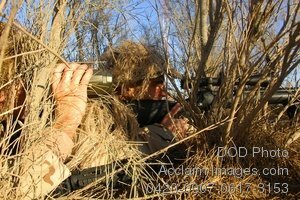 Description: Free, public domain image: Soldiers Camouflaged in Bushes. SOUTHWEST ASIA -- Airman 1st Class Todd Maghamez, right, and Senior Airman Todd Robinson, 386th Expeditionary Security Forces Squadron Close Precision Engagement team, blend in with their environment during a training exercise on Dec. 8 at an air base in Southwest Asia. (U.S. Air Force photo/Tech. Sgt. Raheem Moore.